Welcome to THH. Here you will discover a wide variety of different Luxury Villas that are each available to rent for either long or short term stays. Krabi is a wonderful region that serves as a sort of Southern hub in Thailand, given how much access to many of the surrounding islands that it grants. Many people flock to Krabi each year, to enjoy the wonderful town, but to also use it as a port of call, when checking out all of the other gorgeous surrounding regions. Situated in a luxurious beach-side resort at Ao Nam Mao in Krabi, just 4km from Ao Nang, this two bedroom villa makes for the perfect holiday home. As the name suggests, the Krabi Beachfront Resort Family Suite is the perfect place for families to stay in a location just 20 meters from the each. 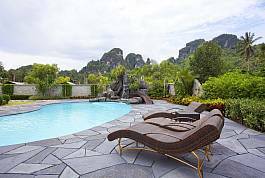 With views of some of Krabi’s famous dramatic limestone karsts, this cosy two-bedroom villa beside a swimming pool is a lovely getaway for a holiday in one of Thailand’s most beautiful and scenic regions. This two-bedroom villa is filled with Thai character and has all the comforts you need to enjoy your superb base where you can totally relax and from where you can head out to explore the stunning scenery and attractions of one of Thailand’s most spectacular regions. 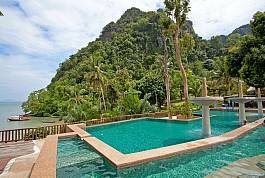 Best value & highest quality holiday villas in Krabi – Get in touch today! Our Villas are of the highest quality only. We work long and hard to put together a great list of desirable accommodation that is both affordable and realistic. With well over ten years of experience in the game, we understand that the best way to play it – is to play it straight up, honest and fair. We would never list a property that we ourselves wouldn’t want to stay in and that is the key to our success. All of our customers walk away feeling content and satisfied, which will in turn aid us in spreading the good word of our services. We are a customer orientated company that strive to deliver results. We want all of our customers to enjoy the perfect, relaxing holiday in a property that we recommended for them. Whether you are looking for escapism or simply a place to catch up on sleep – we will find the perfect fit for you.